The last time the Giants played in the Fall Classic was 2002, when Barry Bonds was at the height of his game and his name couldn’t be brought up without it being synonymous to steroids. Now the G-Men are back in the World Series and things wouldn’t feel right if one of their players weren’t being accused of juicing. That’s where outfielder Jose Guillen (who isn’t even on their postseason roster) steps in. San Francisco Giants outfielder Jose Guillen, left off the team’s postseason roster, is linked to a federal investigation into shipments of performance-enhancing drugs, The New York Times reported on its website Thursday night. The story, citing several unidentified lawyers, said federal authorities told Major League Baseball they were looking into shipments of human growth hormone, allegedly sent to Guillen’s wife in the Bay Area. That was just before the postseason began, The Times said. Guillen was left off the Giants’ roster for all three rounds because of a nagging neck injury, according to manager Bruce Bochy. According to The Times, the Giants were told to leave Guillen off the roster by Major League Baseball. The conspiracy theorist will be quick to say that the Giants left Guillen off their postseason roster because they knew he would eventually be caught with steroids. But Guillen was also dealing with a neck injury weeks before the playoffs began and the Giants were deep in the outfield so they went with healthier options (i.e. Cody Ross, who was the NLCS MVP). Or maybe they did know and if that’s the case, they were smart to tell him to go home. They obviously don’t need the distraction and it’s not like he was hitting before the playoffs started anyway. If he’s going to be busted for HGH, then it’s better that he’s caught when he’s not affiliated with the team. Nevertheless, this isn’t good for Guillen’s career. The Giants picked him up off waivers from the Royals and even before this news broke, the emergence of Ross has made Guillen expendable next season. He won’t be in a Giants uniform next season and if he’s suspended, he may not be in any uniform in 2011. It’s not like the guy has a good track record of being a team player and at his age, he’s not an attractive option right now. It says something when the Royals don’t even want you. Before their sweep of the Braves this week, I would have said that the National League Wild Card is a three-team race. But now that the Rockies are putting together a very Rockie-like charge, this is definitely now a four-horse competition in the NL. Let’s break down the contenders and make a prediction. What I Don’t Like: …that said, this club isn’t playing very good baseball right now. In their last seven games, they’ve won only two and they were just swept at home by the Astros. Also, despite all of their offensive firepower, they’ve managed to score just 16 runs in those seven outings. They also have six more games against the Braves, who they are just 5-7 against this season. This is a club that seemingly can’t put it all together this season and you just get the sense that something’s missing. Jose Guillen can’t play defense, can’t get on base and he can’t hit for average. So naturally Giants’ GM Brian Sabean had to have him. On Friday, the Giants acquired the 34-year-old former Royal, who is well known for having a poor clubhouse reputation. That’s something the close-nit Giants don’t need right now heading into a huge weekend series with the first place Padres (the team the Giants are trailing by 2.5 games in the NL West). Clearly hypnotized by his 16 homers this season, Sabean felt the need to add the outfielder despite the fact that Guillen is more useless than a chair with only two legs. Plus, his acquisition means that Aaron Rowand, Travis Ishikawa (assuming Aubrey Huff moves back to first base) and Nate Schierholtz will receive less playing time than they already are, which is befuddling when you consider that Guillen isn’t a better option than any of them. If I punch myself in the side of the head enough times and squint hard enough, I might see the need for Guillen as a pinch hitter. But there’s no way that the Giants actually believe this schmuck is a starter. Do you know how much ground there is to cover in right field at AT&T Park? Guillen would be an absolute train wreck and for what? A couple of home runs down the stretch? I thought that’s what Pat Burrell was for? Didn’t Sabean already acquire Pat Burrell already? I’m confused. The worst part is, Sabean traded away two capable outfielders earlier this season in Fred Lewis and John Bower – two homegrown players that were better defensively than Guillen and who came with zero baggage. How does trading Lewis and Bowker and trading for Guillen make any sense? Tell me what the difference is between those players, or how Guillen makes the Giants better than Lewis and Bowker? And what happens to Schierholtz? The kid entered spring training as the favorite to start in right field and after a poor couple of weeks at the plate, he became Lewis’d, Bowker’d and Kevin Frandsen’d in the blink of an eye. If I were a Giants’ farm player, I’d want to be dealt immediately because Sabean will eventually block my position with a crusty old vet. It’s only a matter of time. Sabean doesn’t have the slightest clue what it takes to build an offense. For every Burrell, Huff and Juan Uribe, there’s a Rowand, Edgar Renteria and Mark DeRosa (who clearly wasn’t healthy when Sabean decided to hand him a two-year deal this past offseason). For every Bengie Molina trade, there’s a Guillen, Ryan Garko and Freddy Sanchez deal right around the corner. I’ve never see a man make so many stupid decisions and yet retain his job for 14 years. If Brian Sabean were the President of the United States, half the nation would be underwater right now. 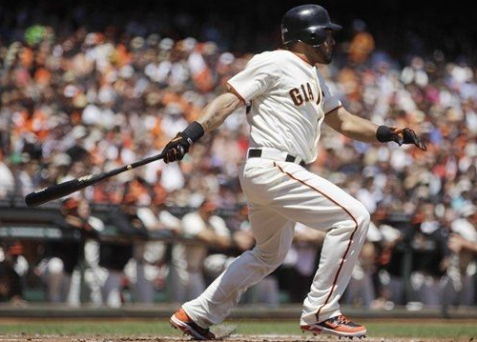 Should Brandon Belt crack the Giants’ Opening Day lineup?